This entry was posted in Inside AdWords and tagged AdWords, Analytics, Google Ads on April 8, 2019 by Google Ads. Read more about this powerful integration between Google Analytics and Google Ads in our guide. And check back next week when we'll post 5 steps to improve media performance. This entry was posted in Inside AdWords and tagged AdWords, Analytics, Google Ads on April 2, 2019 by Google Ads. Google has a crucial stake in a healthy and sustainable digital advertising ecosystem—something we've worked to enable for nearly 20 years. Every day, we invest significant team hours and technological resources in protecting the users, advertisers and publishers that make the internet so useful. And every year, we share key actions and data about our efforts to keep the ecosystem safe by enforcing our policies across platforms. In 2018, we faced new challenges in areas where online advertising could be used to scam or defraud users offline. For example, we created a new policy banning ads from for-profit bail bond providers because we saw evidence that this sector was taking advantage of vulnerable communities. Similarly, when we saw a rise in ads promoting deceptive experiences to users seeking addiction treatment services, we consulted with experts and restricted advertising to certified organizations. In all, we introduced 31 new ads policies in 2018 to address abuses in areas including third-party tech support, ticket resellers, cryptocurrency and local services such as garage door repairmen, bail bonds and addiction treatment facilities. We took down 2.3 billion bad ads in 2018 for violations of both new and existing policies, including nearly 207,000 ads for ticket resellers, over 531,000 ads for bail bonds and approximately 58.8 million phishing ads. Overall, that’s more than six million bad ads, every day. As we continue to protect users from bad ads, we’re also working to make it easier for advertisers to ensure their creatives are policy compliant. Similar to our AdSense Policy Center, next month we’ll launch a new Policy manager in Google Ads that will give tips on common policy mistakes to help well-meaning advertisers and make it easier to create and launch compliant ads. Last year, we also made a concerted effort to go after the bad actors behind numerous bad ads, not just the ads themselves. Using improved machine learning technology, we were able to identify and terminate almost one million bad advertiser accounts, nearly double the amount we terminated in 2017. When we take action at the account level, it helps to address the root cause of bad ads and better protect our users. In 2017, we launched new technology that allows for more granular removal of ads from websites when only a small number of pages on a site are violating our policies. In 2018, we launched 330 detection classifiers to help us better detect "badness" at the page level—that's nearly three times the number of classifiers we launched in 2017. So while we terminated nearly 734,000 publishers and app developers from our ad network, and removed ads completely from nearly 1.5 million apps, we were also able to take more granular action by taking ads off of nearly 28 million pages that violated our publisher policies. We use a combination of manual reviews and machine learning to catch these kinds of violations. From reports of “fake news” sites, to questions about who is purchasing political ads, to massive ad fraud operations, there are fundamental concerns about the role of online advertising in society. Last year, we launched a new policy for election ads in the U.S. ahead of the 2018 midterm elections. We verified nearly 143,000 election ads in the U.S. and launched a new political ads transparency report that gives more information about who bought election ads. And in 2019, we’re launching similar tools ahead of elections in the EU and India. We also continued to tackle the challenge of misinformation and low-quality sites, using several different policies to ensure our ads are supporting legitimate, high-quality publishers. In 2018, we removed ads from approximately 1.2 million pages, more than 22,000 apps, and nearly 15,000 sites across our ad network for violations of policies directed at misrepresentative, hateful or other low-quality content. More specifically, we removed ads from almost 74,000 pages for violating our “dangerous or derogatory” content policy, and took down approximately 190,000 ads for violating this policy. This policy includes a prohibition on hate speech and protects our users, advertisers and publishers from hateful content across platforms. In 2018, we worked closely with cybersecurity firm White Ops, the FBI, and others in the industry to take down one of the largest and most complex international ad fraud operations we’ve ever seen. Codenamed "3ve", the operation used sophisticated tactics aimed at exploiting data centers, computers infected with malware, spoofed fraudulent domains and fake websites. In aggregate, 3ve produced more than 10,000 counterfeit domains, and generated over 3 billion daily bid requests at its peak. 3ve tried to evade our enforcements, but we conducted a coordinated takedown of their infrastructure. We referred the case to the FBI, and late last year charges were announced against eight individuals for crimes including aggravated identity theft and money laundering. Learn more about 3ve and our work to take it down on our Security Blog, as well as through this white paper that we co-authored with White Ops. We will continue to tackle these issues because as new trends and online experiences emerge, so do new scams and bad actors. In 2019, our work to protect users and enable a safe advertising ecosystem that works well for legitimate advertisers and publishers continues to be a top priority. This entry was posted in Inside AdWords and tagged Ads, AdWords, Google Ads on March 14, 2019 by Google Ads. Let's face it, the majority of players you acquire aren't going to continue engaging with your game after just a handful of days. One of the biggest opportunities you have to grow your business is to get those inactive players to come back and play again. Learn more about it here or talk to your Google account representative if you’re interested in trying it out. Acquiring and retaining users is important, but retention alone doesn’t generate revenue. Our internal data shows that, on average, less than four percent of players will ever spend on in-app items. One way to increase overall revenue is through ads. 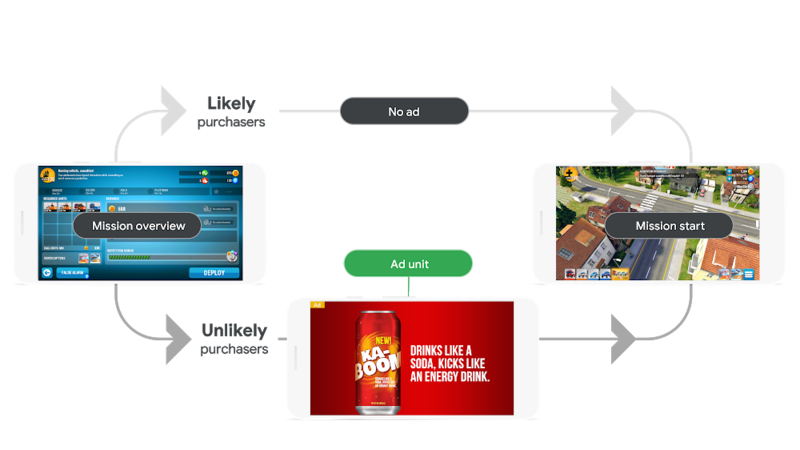 However, some developers worry that ads might hurt in-app purchase revenue by disrupting gameplay for players who do spend. What if you could just show ads to the players who aren't going to spend in your app? Good news—now you can. I'm excited for the week ahead and all the new games you’re building—I’m always on the lookout for my next favorite. 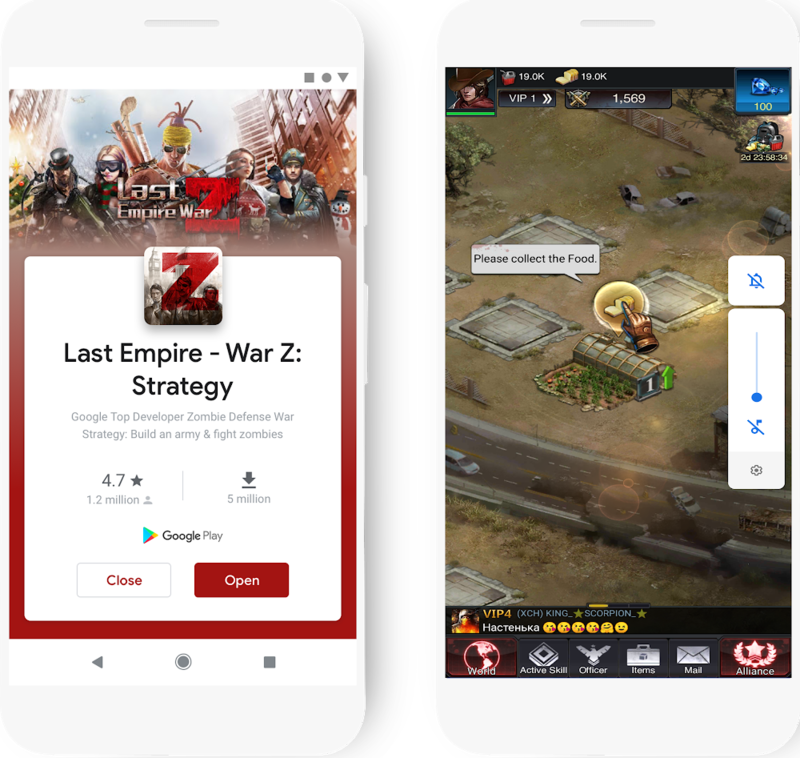 This entry was posted in Inside AdWords and tagged AdMob, AdWords, App Ads, Google Ads on March 13, 2019 by Google Ads. This entry was posted in Inside AdWords and tagged AdWords, Google Ads on March 12, 2019 by Google Ads. At YouTube, we’re on a constant quest to give people the perfect viewing experience. But over the years, what that looks like has changed significantly. The way we watch video is always changing. And we want to keep advertisers abreast of these trends, with new ad experiences molded to the new ways people watch. This was the spirit behind our introduction of six-second bumper ads more than two years ago–as a response to the increasingly mobile habits of our users. Today we’re highlighting how we're adapting to three new trends in the user experience. Example of an ad pod experience on mobile. The way users prefer to find videos to watch is also changing. Remember back when the only YouTube videos you’d watch came in the form of a shared URL from a friend? Over the years, video viewing on YouTube has become more self-directed, as more viewers than ever before hop into their home or trending feeds and scroll to find a recommended video. In fact, over the last three years, watch time from content users discover on the YouTube homepage has grown 10X.3 That’s why we brought TrueView video discovery ads to the YouTube home feed, along with the Masthead and Universal App campaign ads. The YouTube home feed continues to be a great place for users to discover their next favorite creator, and now it can be a great place for them to discover your brand. 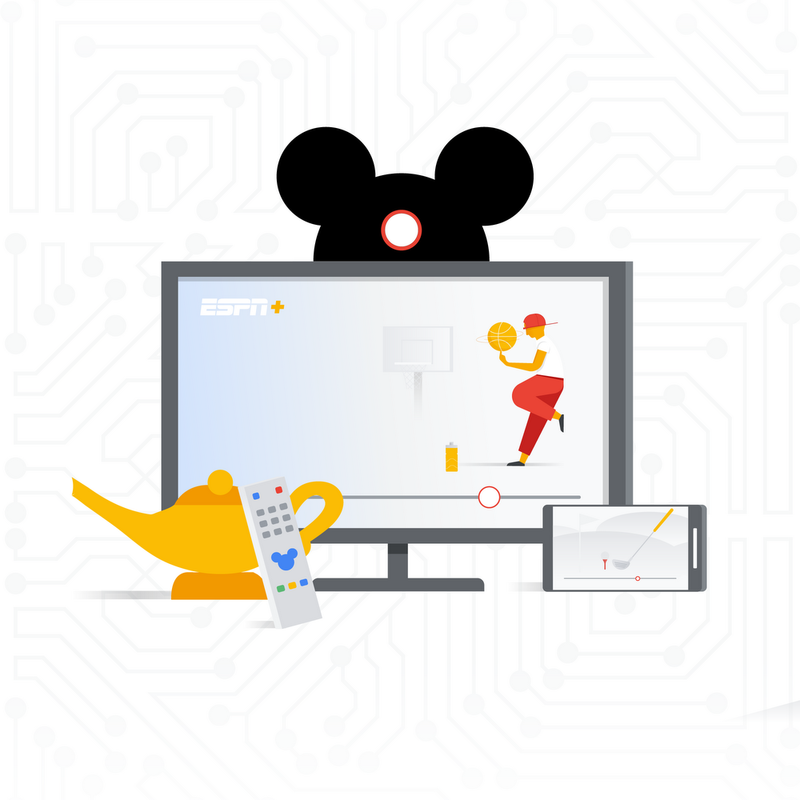 We’re seeing incredible watchtime growth on TV screens: on average, users watch over 180 million hours of YouTube on TV screens every day.4 Last month, we introduced the TV screen device type in Google Ads and Display & Video 360, allowing you to tailor your campaigns for connected TVs – for example, by using a different creative or setting a specific device bid adjustment – and see reporting for ads that run on TV screens. In the face of these burgeoning user trends—as well as the next wave, and the next—we’ll continue working to build the ideal video viewing experience, and keep thinking up ways to deliver value for our advertiser partners. This entry was posted in Inside AdWords and tagged AdWords, Google Ads, Video Ads on November 21, 2018 by Google Ads. Thank you for following the Google Ads blog, the best place to find the latest news, insights and stories about Google Ads. As the product improves, we want to make sure you have an easy way to stay up to date on the latest changes, big and small. 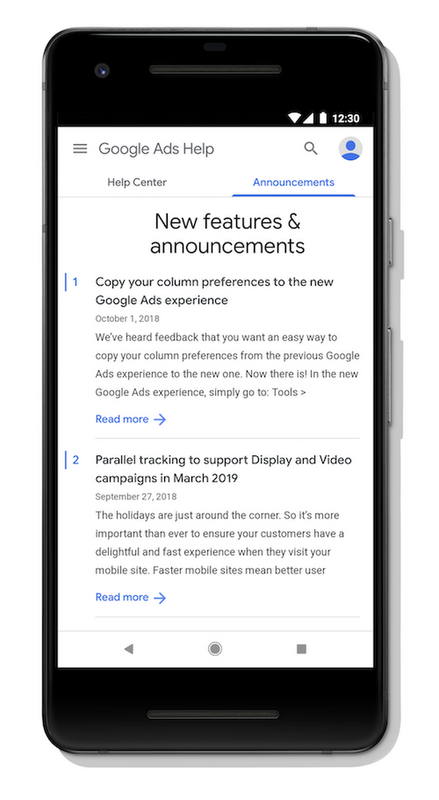 The new features & announcements page in the Google Ads Help Center, covers all new features in Google Ads - from something as simple as a new column being added, to the launch of a new ad type such as Responsive Search Ads. This entry was posted in Inside AdWords and tagged AdWords, Google Ads on November 1, 2018 by Google Ads. With the busy holiday season ahead, we're investing in new ways to help you work smarter and exceed your omnichannel goals. Check out the innovations we unveiled today at SMX East. Email forwarding sends text messages to your email, so you don’t need to provide a phone number to use message extensions. Responding to the email will automatically send a text reply back to your customer. To help measure the success of your click-to-message ads, we’re expanding message reporting to include message conversions. You’ll be able to define the number of user-initiated exchanges needed to count as a conversion. For example, if it typically takes two or more exchanges before a customer orders holiday dinner from your restaurant, you can set that as your conversion threshold. Most customer journeys still end in store, and 61% of shoppers would rather shop with brands that have a physical location than ones that are online only.1 Businesses need to measure the offline impact of digital advertising in order to take action on omnichannel behavior: store visits measurement is one way to do that. As a reminder, store visits are estimates based on data from users that have turned on Location History. Only aggregated and anonymized data is reported to advertisers, and they aren’t able to see any store visits from individual website visits, ad clicks, viewable impressions, or people. To help you take action on store visits, we're bringing these insights to data-driven attribution and Smart Bidding which use machine learning to help you improve performance. Data-driven attribution helps you understand which keywords, ads, ad groups, and campaigns have the greatest effect on your business goals. You can use this information to drive more conversions using Smart Bidding. We’re also adding more ways to measure the full value of your marketing. In the coming weeks, Store Visits in Google Analytics will start rolling out to eligible advertisers to connect store visits to other marketing efforts that bring customers to your website and then to your store. One example of a business measuring the online to offline impact of its marketing is department store JCPenney. JCPenney had long recognized that digital campaigns led to store visits but wasn’t able to attribute those visits to specific channels. With Store Visits in Google Analytics, JCPenney was able to look at store visits and visit rate by channel to understand which online marketing channels were most effective in driving in-store visits, and efficiently scale investment in those channels. We hope these new products can simplify your day-to-day and improve performance across your Google Ads campaigns during the holiday season and beyond. 1. Google/Ipsos, “Shopping Tracker,” April - June 2018, Online survey, US, n=2703 adults 18+ who shopped in the past two days. Response based on top 3 box 7 pt scale. This entry was posted in Inside AdWords and tagged AdWords, Google Ads, Search Ads on October 25, 2018 by Google Ads. The heightened role of video throughout today’s consumer journey is an exciting opportunity for marketers to build connections that drive better business outcomes. At Advertising Week New York, we’re announcing new ways for marketers to become more effective full-funnel storytellers using the combined power of YouTube’s creative canvas with Google’s machine learning and measurement solutions. Soon you’ll be able to make your video ads more actionable with a greater variety of ad extensions. Similar to extensions on Search ads, extensions on YouTube enhance your video ad with additional useful information—giving consumers more reasons to take action. You can already add location and form extensions (currently in beta) to your TrueView in-stream ads. Now we’re exploring additional use cases that encourage viewers to complete lower-funnel actions like finding the next movie showtime, downloading an app or booking a trip. Brands like Vodafone, Chili’s, 20th Century Fox, Headspace and Maybelline are already using extensions for video ads to bring more relevance to their mobile ads and drive impact on the metrics that matter most. Using extensions, Vodafone drove a 2.3x incremental lift in Ad Recall and a 3.5 percent CTR—a 785 percent increase over their regional benchmark. Video storytelling isn’t just about driving short-term campaign wins—it’s also about driving measurable results at every stage of the consumer journey. We know this is easier said than done, which is why we’re evolving our Brand Liftsolution and partnering with IRI to make it simpler for advertisers to measure and act upon upper- and lower-funnel metrics. Based on your feedback, soon you’ll be able to set up Brand Lift studies directly in Google Ads or Display & Video 360 and conveniently view reporting alongside your other ad metrics. We’ve also started sending Brand Lift surveys continuously throughout the duration of your campaign so you can understand how your video ads are influencing viewer perceptions in near real time. Additionally, we’ve introduced two new metrics: lifted users, the number of people who were influenced by your ad, and cost-per-lifted-user to make it easier for you to optimize your campaign’s effectiveness and cost-efficiency. To get the most out of these new measurement tools, we recommend using Maximize Lift bidding. We're also ramping up our investments in Google Measurement Partners to ensure our advertisers can measure YouTube media with measurement solutions that meet rigorous, verified standards. We work closely with partners to ensure their solutions respect user privacy. In addition to Nielsen Catalina Solutions (NCS) and Oracle Data Cloud, soon CPG advertisers will have the option to measure their YouTube media using IRI. These offerings complement geo experiments with Nielsen MPA, giving advertisers a variety of options for seeing the offline impact of their video ads. Last week we also announced expanded integrations for brand suitability and reach reporting, continuing our commitment to providing both quality and choice when it comes to helping marketers better understand their media investments. We’re excited about how these capabilities can help take your campaigns to the next level, driving real business impact all along the customer journey. This entry was posted in Inside AdWords and tagged AdWords, Google Ads, Video Ads on October 1, 2018 by Google Ads.